KELOWNA, BC, Jan 21, 2015/ Troy Media/ – Sometimes the best trips are the ones you never planned on taking. We had some vacation rental time that was soon to expire and, much to my surprise, I was able to exchange a one-week stay in a tiny Puerto Vallarta studio condo for a two-bedroom unit at the Delta Grand Okanagan Resort and Conference Centre in Kelowna, British Columbia. Of course, there was a catch; it was for mid to late February and we aren’t really the skiing types. For those of you not familiar with the city of Kelowna, it’s located in central B.C. on the eastern shore of Lake Okanagan and is the Okanagan Valley’s largest city, with a population of over 120,000. Its summers are hot, averaging around 27C (81F) and winters mild, with temperatures averaging just below freezing. Read full article at Troy Media. As the mercury climbs, we do away with the hoodies and tracksuits and opt for T-shirts and shorts we find ourselves with fewer pockets and places to keep our keys, smartphones and the like as we head out and about for a walk or a run. One solution to avoid a knapsack or a bulky fanny pack is the TruRunner by Bracketron, a sturdy diminutive lightweight waist pack to store the necessities you need to carry. TruRunner has a fully adjustable elasticized belt that hugs nicely to your body. Its pleated in-line pocket, may not look like much, but actually expands quite nicely allowing you to store things like your iPhone, keys and perhaps another small personal item or even a granola bar. It’s lining is weather resistant to keep your electronics dry and a weatherproof sealing zipper can help avoid leaks. I wholeheartedly resist calling TruRunner a fanny pack, for the simple reason that that term conjures up images of the 1990s humongous multi-zippered leather pouch that looked more like a life preserver than a portable storage pack. Trendy boutique hotel on trendy Whyte Ave ideal for business travellers too! EDMONTON, AB, Feb 4, 2014/ Troy Media/ – I live in Edmonton and enjoy the trendy urban neighbourhood of Old Strathcona, which is located south of the North Saskatchewan River across from the city centre. 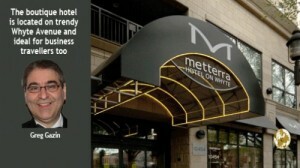 So during a recent staycation I decided to try out the Mettera Hotel on Whyte Avenue. I was more than pleasantly surprised. The Metterra on Whyte Hotel is a boutique hotel located smack-dab in the middle of Old Strathcona on the busy Whyte Avenue (82nd Ave) and surrounded by a good selection of bars, restaurants, coffee shops, gift shops, book and clothing stores and live entertainment venues. If you didn’t know the hotel was there, you might miss it as it can easily get lost in the sea of retail signage in the area. As a kid growing up I relied heavily on bicycles and roller-skates but when it came to things like skateboards, I didn’t feel like I had the combined agility and leg power needed to take me on longer distances. And while I’m much older now, the new Yuneec E-Go Cruiser skateboard just might coax me into reliving that time in my youth. It’s not often that you see two people sharing the same audio source from an iPod, smartphone or tablet, but when the need arises, it’s nice to know that each individual has the ability to control his or her volume with the new Audio Splitter from Wicked Audio. When you hear “mobile home”, the first thing that comes to mind is a house on wheels. But this mobile home is nothing like a house trailer; this one is a portable replacement for your iPhone’s home button. Mobile Home is a creation of Plano, Texas based, Beanco Technology. It’s like they’ve detached your iPhone`s home button and put it in a little package that resembles a garage door remote. Just like the garage remote, simply mount Mobile Home on your dash or attach it to the visor in your car. With a push of a button, you can bring Siri to life, leaving your iPhone’s features usable while it’s safely and legally in your pocket or purse. The concept is so simple you wonder why someone hadn’t come up with it sooner. CABO SAN LUCAS, Mexico, Aug 31, 2013, Troy Media/ – When I think of travelling to Cabo San Lucas, Mexico, the first thing that comes to my mind is all-inclusives.